Bees have been in the news quite a lot lately thanks to the trials and tribulations that they've been forced to undergo lately at the hands of pesticides and other issues that cause colony collapse disorder. They rarely tend to get mentioned in the art world news, however, regardless of their complicated language of dancing and their sommelier-like honey-making abilities. That's all changed now, thanks to the British installation artist Wolfgang Buttress and his latest piece, entitled Hive (shown above, courtesy of Jeff Eden/RBG Kew). The piece is located in London, in the Royal Botanical Gardens at Kew, close to where it's bee masters are. The piece is a whopping 17 meters tall and was constructed out of 170,000 pieces of aluminum that are suspended in a massive framework. 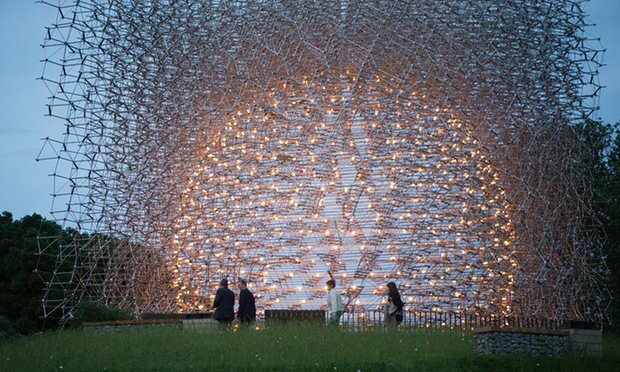 Dotted throughout the framework are speakers and LED lights which respond to the movements and communications of the bees located in the control hive, elsewhere in the Royal Botanical Gardens. “My approach to a sculpture seeks to frame nature so one can experience it more intimately. I want visitors to feel enveloped, wrapped-up and involved in the experience, rather than adopting the position of an external observer," explains Buttress. Visitors can walk into the center of the structure and gain a sense of the tremendous complexity of what's happening inside the control hive, although perhaps 'control' isn't exactly the right word for what's happening. It's more of a reactive sculpture, but it also has an interesting scientific component that catapaults it from the cool to the useful, thanks to the pioneering work in the field of honeybee communication by Martin Bencsik at Nottingham Trent University. An admirable sentiment, and one that will hopefully be echoed in other public works that seek to rebuild our connection to the natural world. We've isolated ourselves from the natural world quite thoroughly in the center of a city, and in some ways that's a wise choice, but in many profound ways it can be more damaging than it's worth.